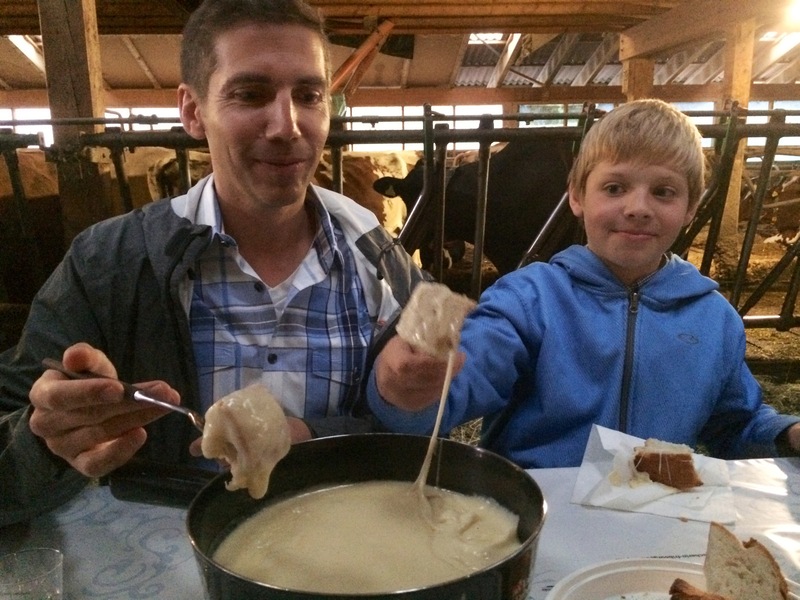 Last night, we ate Switzerland’s favorite kind of fondue (“moitié-moitié” – half Gruyère cheese, half Vacherin Fribourgeois cheese), made with the best cheese in Switzerland, in a barn with the grass-fed and free-range cows that provided the milk for the aforementioned cheese. I am struggling with the superlatives to describe how much I enjoyed this. So how did this come to pass? For the last three weeks, PapaHatch has been taking an intensive French class, along with about 50 other people, primarily exchange students from all over the world (side note: he is totally the old geezer of the group. Last night I was talking to an American college student and said I had a friend who had gone to her college ‘but that was a long time ago,’ and her reply was a cheerful, “oh, my dad went there too – maybe he knew your friend!” Ouch!). 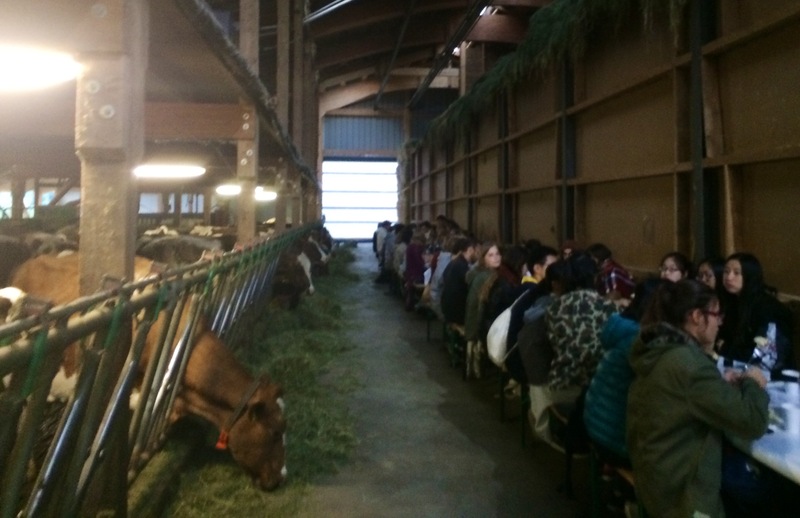 ANYWAY, back to the main story… As a fun closing event, the course organizers arranged a tour of a cheese factory, followed by a fondue dinner. That’s all we knew about what was in store for us. 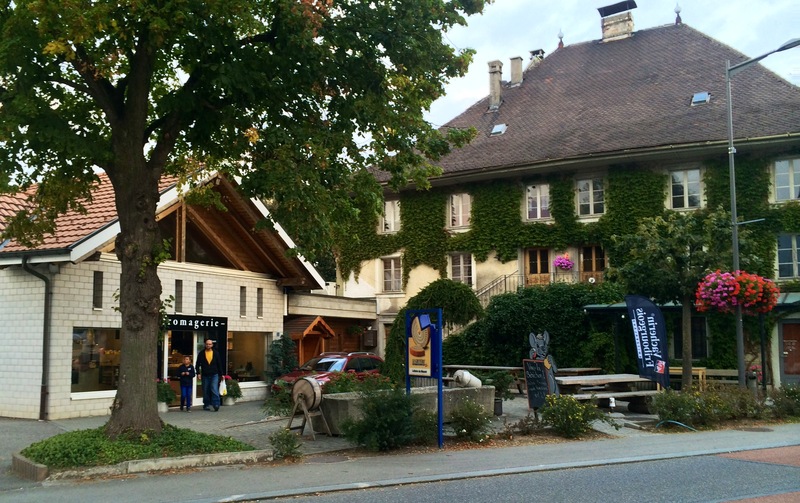 After gathering at the meeting place, we walked (and walked…) to a bus, which then drove us for about 20 minutes to a small town, which turned out to be Le Mouret, and gathered in front of an adorable and elegant fromagerie/dairy. 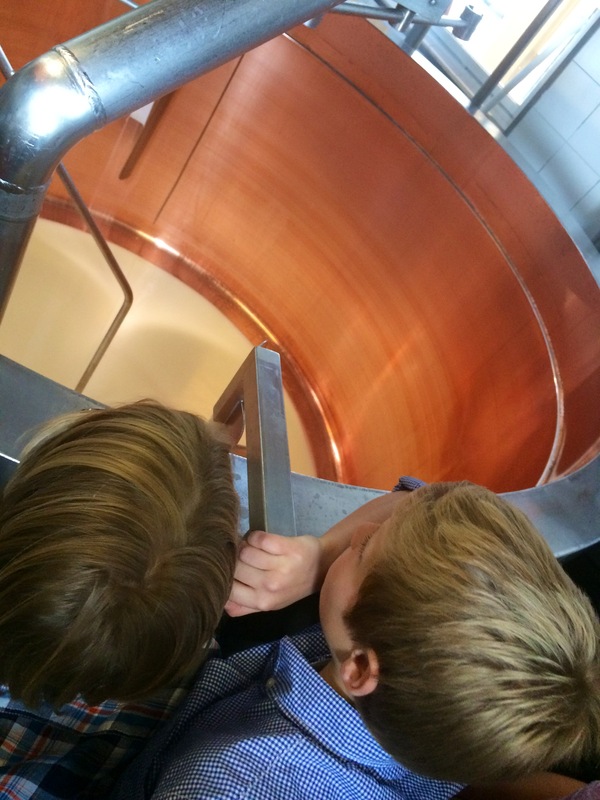 Soon enough, the fromager himself came around and led us on a tour through his small factory, with plenty of gamey smells to heighten the experience. The highlight for me was seeing the “cave” where the 35 kilo (77 lbs.) rounds of Gruyère cheese are stored at a carefully-controlled temperature to control the aging. These rounds rest on wood planks (only from fir trees) and are wiped off and rotated on a daily basis to control the humidity within. They cannot be sold to the public until they are aged at least five months and are usually sold as aged 6, 12 or 24 months (the longer the cheese ages, the stronger the taste). The name “Le Gruyère AOP” is a carefully protected trademark (AOP = “appellation d’origine protégée”), and cheeses that are allowed to carry this label are inspected monthly. 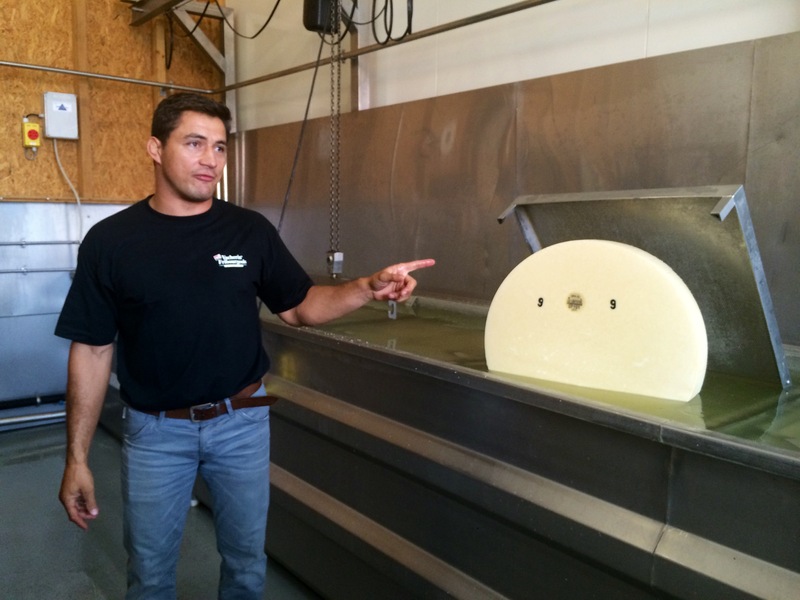 The inspector taps randomly selected rounds of cheese to listen for any abnormalities indicating the wrong level of air bubbles and tastes samples as well. This particular fromager uses only milk from cows within a 5km radius of his factory and store. And speaking of these sweet cows…. We were then transported to a farm not far away, in the midst of rolling green hills dotted with cute towns, their medieval towers rising through the rooftops. 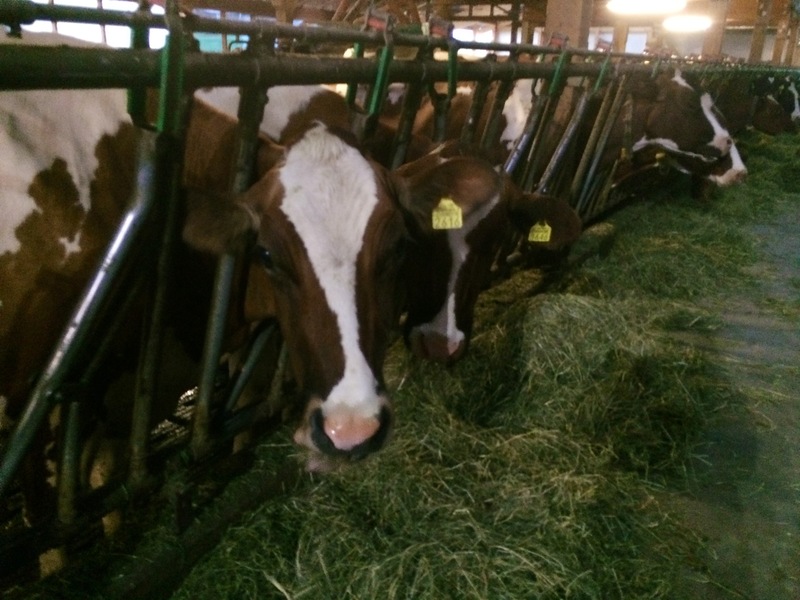 As we stood outside the closed barn, the farmer explained that his cows each have a name and are all baptized, eat a balanced mixture of grass and hay, roam outside every day, and have their own sleeping spots in the barn, with a big scratching post on each end. 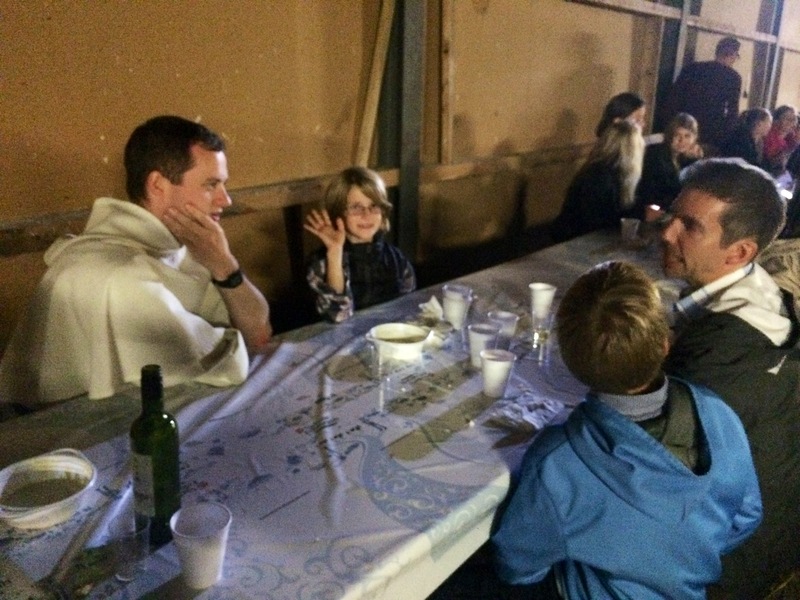 With that warm welcome, they opened the barn doors, and to our collective gasp, we saw a long table set for dinner for us, right alongside the cows. 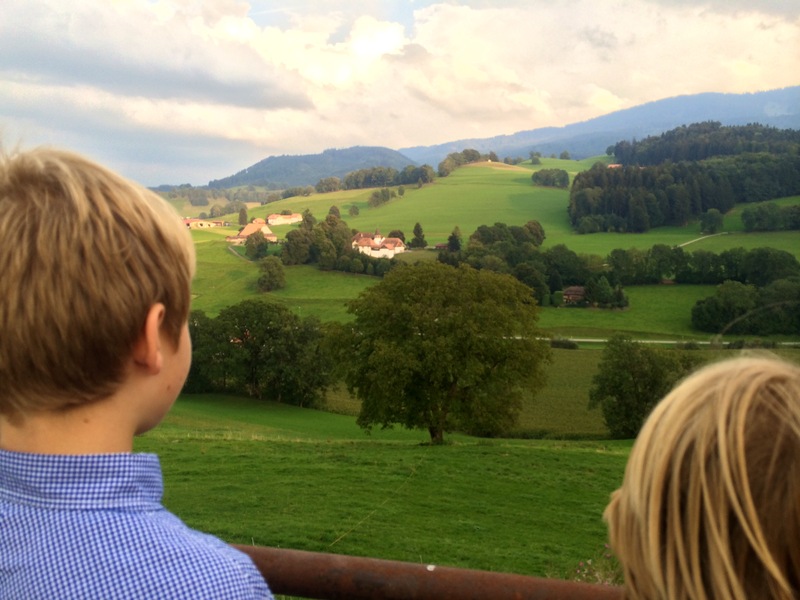 I was beyond excited for this exquisite dining experience, and the kids were beyond excited for fondue… cheese is their very favorite thing about living in Switzerland, surpassing even chocolate. This fondue was absolutely fantastic: creamy, not too heavy, the perfect balance of cheese to wine. By the way, the Swiss are very specific about what is to be drunk alongside fondue: fendant wine (a light, refreshing white wine from the Valais region) or tea. Absolutely not beer or water, which would most assuredly cause stomach upset! The sensual overload was almost too much to process: the communal activity of dipping the bread into the same pot and twisting it just right, the delightful taste, texture and warmth of the fondue itself, the smells of a working barn – at first accosting the nose and then quickly enhancing the evening – the pleasant sounds of cows chewing their cud and the occasional moo, and all the while their watchful eyes assessing how much we were enjoying the fruits of their labors. 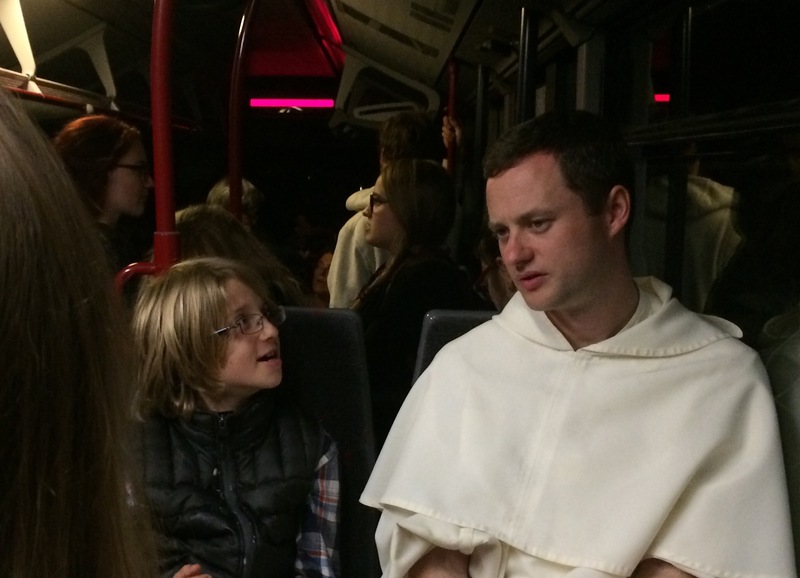 To top it all off, we sat with a delightful companion: a young Irish Dominican priest who is pursuing his masters in theology at the University of Fribourg. 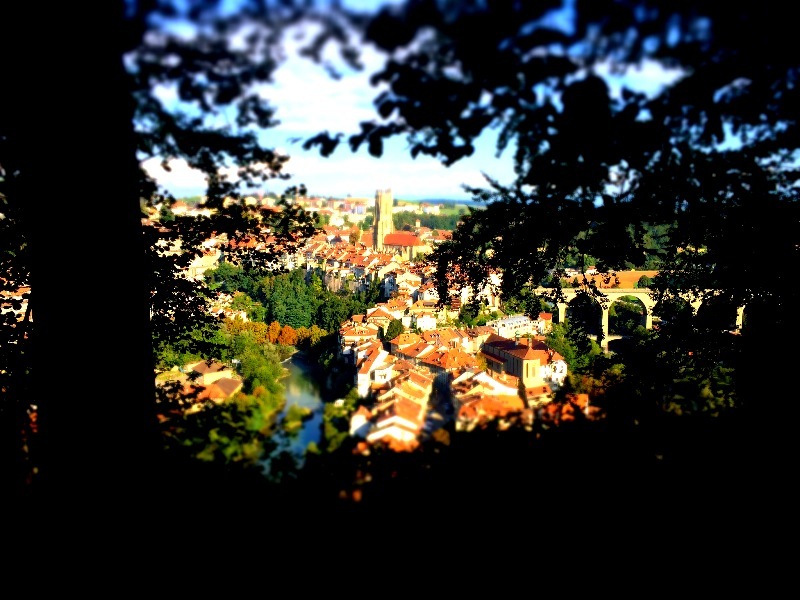 Those who know me know that I adore small world coincidences, and it so happens that a friend of mine from college – also a Dominican priest who lived in Fribourg for three years (a small world thing in and of itself!) – taught a seminar in Dublin that our new friend had taken. Well, this guy charmed our entire family. I haven’t seen our kids look that adoringly at anyone in a long time (fondue and chocolate, ok, but other people? It’s been a while). Topics included Harry Potter, teaching, rugby, what happens after we die and back to Harry Potter. A truly remarkable evening. I will forever treasure this wonderful, unique experience. What great experiences you are having. Thanks so much for the updates. Have you thought about a book? Wow. And as I read this (your writing is exquisite, by the way) I have renewed appreciation for where we live in the Northeast Kingdom of Vermont. Seeing what we may be taking for granted, here, through your eyes and family’s experience is so rich and so familiar (other than the medieval towers). That said, I’d love to enjoy your experience, there. And the French immersion that PapaHatch went through… I would Love that, too. Thanks so much for sharing, the wonderful balance of challenges and joys is quite special.